You know when you open a bag of potato chips telling yourself you’re only going to have a couple and then you end up eating the whole bag? You’re not even sure why you ate them all because they didn’t taste that great. .
That’s kind of how I feel about The Following, premiering tonight at 9 p.m. on FOX. When FOX sent out the screener of four episodes last month, I sat down thinking I would only watch one episode that night. After the first episode was over, I thought, “I’ll just watch the first fifteen minutes of the next episode and then I’ll go to bed.” Cut to me up watching all four episodes in a row and staying up until 2 a.m. So there’s no way I can deny there’s something innately compelling about this drama from Kevin Williamson (Dawson’s Creek, Scream, The Vampire Diaries). I just didn’t necessarily feel that great after binge viewing the show. Kevin Bacon stars as former FBI agent Ryan Hardy. In 2003, Hardy captured serial killer Joe Carroll (James Purefoy), who had murdered 14 female college students. Now Carroll has escaped and the FBI calls in Hardy to once again put a stop to Carroll’s murderous spree. But it seems that former college professor Carroll, who is obsessed with the writings of Edgar Allen Poe, has been very busy in jail. He’s become something of a cult leader to depraved people seeking acceptance and a group of their own. Adding a romantic angle to all the violence, Carroll’s ex-wife Claire Matthews (Natalie Zea) and Hardy fell in love during the investigation but haven’t spoken in years. Is it a preposterous notion that a serial killer would be able to amass followers who would want to carry out his bidding? Not necessarily. We live in a crazy world. Do I want to see these followers commit violent acts on a weekly basis? Not necessarily. Williamson excels at creating suspense. 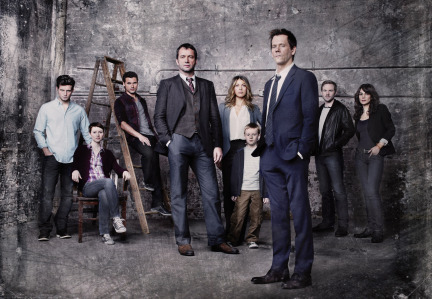 The Following has shocking plot twists and reveals. Williamson has said he was a huge fan of 24 and you can definitely see that. The Following has a distinct 24 feel. Bacon, in his first foray into television, is a compelling lead. As with Kiefer Sutherland’s Jack Bauer, you’ll kind of believe Ryan can do anything. No Ryan isn’t crossing Los Angeles in 15 minutes or uploading complicated schematics to his cell phone but like Jack Bauer, he’s the only one who can stop Joe Carroll. Like Jack Bauer, Ryan Harding is a damaged, troubled soul. He’s sacrificed everything for his job. Like 24, The Following manages to quickly get viewers invested in new characters. And like 24, you’ll start to doubt everyone. (I don’t want to spoil anything right now but in a few weeks we can discuss who I’m most suspicious of). Purefoy plays Joe Carroll as all charm. This is a man who doesn’t feel bad about what he’s done or what he’s going to do. He feels no remorse. No guilt. That may work for a movie. But I’m not sure how it will work for a TV show, especially when this is essentially a two-man show. At some point I’m sure the series, which is already prone to flashbacks, will tell us exactly what made Joe Carroll Joe Carroll. But I don’t care about his motivations. Even before all the most recent talk about violence in our entertainment, I wasn’t sure if I wanted to watch a weekly TV series about a serial killer with a cult following. The Following often feels like violence for violence sake. And it must be addressed how misogynistic the show is. A lot of women die and are tortured. A lot. Their deaths are gory and brutal. Despite the talent both in front and behind the camera, the show leaves you feeling rather empty. After that bag of chips, you may vow to only eat fruit and vegetables for a week. And that’s kind of how I felt about The Following. The show made me want to sit down to a marathon of the kindler, gentler, much better series Switched at Birth. After you have watched The Following, let me know what you think in the comments section or by emailing me through my contact page. This entry was posted in The Following and tagged James Purefoy, Kevin Bacon, Kevin Williamson by TV Gal. Bookmark the permalink. I love Kevin Bacon so much and I so wanted to love this show. But after the girl stripped naked and stabbed herself in the eye, I was done. I switched over to Bunheads…a softer, gentler way to end my evening. That scene was tough to take and believe me it gets worse! I tweeted you about it (@ellabronx) but I can completely see where you’re coming from. As much as I want to see what’s coming next, I had some problems with the pilot. I thought Bacon was a little off. I guess that could just be his character, but I couldn’t help but feel his performance was lacking something. Also, there was a lot of frontloading that took place in this episode. Instead of stretching the back story out they kind of just threw all the information at you at once. I hope it pays off. On the plus side, I really like the idea of 14 episodes in 14 weeks! There’s a lot more back story in the next three episodes. I’ll be curious to hear what you think.